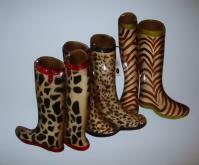 We love this fun rain boot wall art! Add a touch of whimsy to your space with this decorative piece! This unique and colorful boot shaped wall art is a striking touch for your mudroom, foyer or child’s bedroom. It is crafted from metal and features bright and shiny colors that will brighten your decor. For more details visit www.cheapchicdecor.com.